Whether you live in an all-year-round warm climate, or you live where there are four seasons, nothing beats a dive in cool water on a hot day. Swimming in the ocean, a river, or at a lake, may entail camping gear, travel trailers, food preparation, and lots of planning. Many families are choosing an above ground pool for their backyards to keep the family outings easy and at home. Above ground pools can be setup and ready for eager swimmers in a few days, allowing you to create a private oasis in your own yard. Part of pool ownership is maintaining the cleanliness of the pool water and choosing the best vacuum for an above ground pool is an important decision. We've explored the top 5 above ground pool vacuums and put together our reviews to make it easy for you to make the best decision for your above ground pool needs. 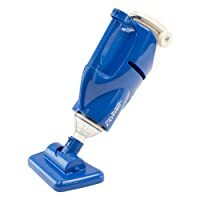 This XtremepowerUS Automatic Suction Vacuum climbs the walls do you don't have to! Even though that’s a play on words, this above ground pool vacuum has all the power you need to pick up algae, dust, sand, dirt, and bugs from the bottom of your pool and the walls! It has an adjustable cleaner and diverter that allow it to climb the pool walls, removing algae and sand that may have accumulated on the creases of the liner. With 30 feet of hose, you can clean any size pool up to 30 feet in length or around. The Water Tech Pool Blaster Catfish Li Pool & Spa Cleaner doesn't require a hose to vacuum your pool. It has 2 filters to trap dirt, making it easy to use. A lithium battery makes it carefree and will last for close to 45 minutes of cleaning time. Attach this to a telescopic pole to the vacuum to use and keep your pool water sparking clean. The filter bag is reusable and this vacuum can even pick up leaves. Comes with 1 reusable filter and 1 microfilter for fine dust and particles. Some customers complained at how often you have to change the collection sock. The Hayward series of above ground pool vacuums are a trio of adorable characters with a job to do; keep your pool clean and fresh! 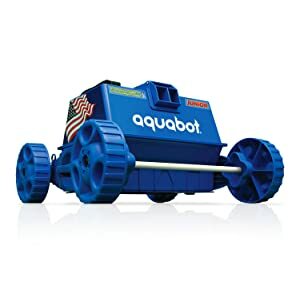 These little characters have great features like programmed steering and a turbine/gearing system allow the vacuum to glide smoothly over the bottom of your pool to get every spot! 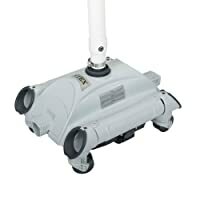 The long hose makes this automatic vacuum assistant able to get around all the areas of your pool. And the cute characters add to the summer fun! Intex offers their newly designed pool vacuum to accommodate their popular ring pools. The soft bottoms of ring pools are safe in the hands of this Intex Pool Cleaner but it works equally as well in frame pools of any shape or size. Self propelled, you can set this up and let it run until it covers the entire bottom of the pool. Some customers complained about the vacuum getting stuck against the pool wall. As of 2015, there were more than 3,400,000 above ground pools in the backyards of American families. And not every backyard pool is the same. But the great thing about above ground pools is the savings. An in-ground pool can cost upwards of $30,000 while an above ground pool can cost closer to $5,000. You spend almost 80% less and can have the pool setup quickly and without a demolition crew in your yard. There are several options for above ground pools. And it helps to know what pool vacuum works the best with your pool. Here are the more common above ground pool types. A ring pool is a temporary setup unless your climate stays above freezing. Ring pools are commonly sized at 12 feet round and no more than 3 feet deep. The top of the pool has an inflatable ring that gets filled with air before filling the pool with water. These pools end up being shaped like a flask; fatter at the bottom and thinner at the top. This helps with stability. A ring pool that's 12 feet round typically holds 1,400 gallons of water, enough to require filtration and chlorine. 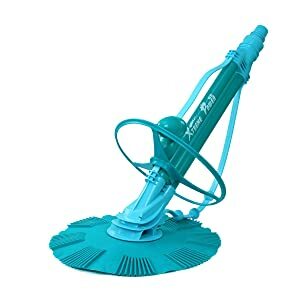 The pool vacuum that would work well for an inflatable pool would be the Intex Auto Pool Cleaner being that it's not very deep, can have a bottom that’s soft and not level, and is made from vinyl that could be punctured. This vacuum is made for the Intex ring pools and is a manual cleaner with a built in lithium battery. It's easy to hook up to an extension pole and vacuum your pool without hoses or worrying about the power of your filter. A frame pool is made from metal and has a liner for the inside. There are different types of frame pools made with various materials. Frame pools are sturdier and remain setup year-round or permanently. Care has to be taken to winterize the pool when climates are prone to freezing temperatures. The most common shape and size for a frame pool is a 24 foot-round pool. The pool wall can be anywhere from 48 inches high to 54 inches high and would need a ladder to climb in and out of. Whether a frame pool is round or oval, the two typical shapes, the options for vacuuming the pool are more open than with a ring pool. Because of a powerful filtration system and a stable wall with a liner, you can use several pool vacuums. The length of the hose is important and how the vacuum hooks up to your system. 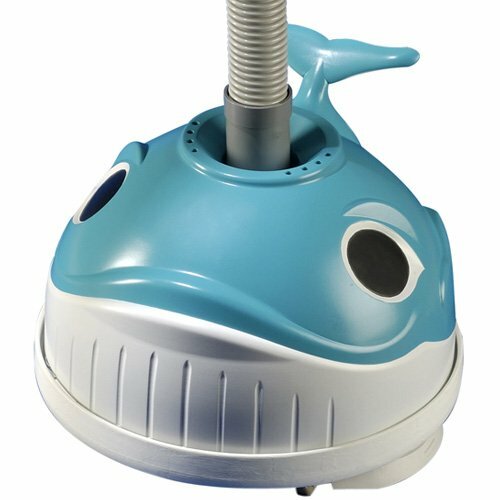 We like the Hayward 900 Wanda the Whale Suction Above-Ground Pool Cleaner for its whimsical design including three different adorable characters; Penguin, AquaBug® and & Wanda the Whale®. They run on the pool's filtration system and make keeping your pool fun! A framed pool is safe with any of the filters we reviewed here. It depends on your budget and if you like the Hayward group of characters! Keeping your backyard pool clean and sparkling can be handled on a regular schedule making it easier. You can plan on checking the water levels, skimming the top of the water, and vacuuming the bottom all at the same time. It gets done quicker and will keep from having larger problems with your water later. Part of pool maintenance is keeping the water levels 'above' the skimmer line so air doesn't get into the filter system. If you have a solar cover, you'll lose less water. Still, check the water level every few days and add more water as the water drops. You also want to keep an eye on the water in case there may be a hole in the liner that needs repair. Part of keeping the water fresh and clean is using a pool water testing kit to check the chlorine and PH at the proper levels in the water. Each kit will have a limit for too high and too low levels and it also helps if you purchase one with alkalinity and calcium levels. Do this once a week or if the water is looking cloudy or a bit green. Follow the manufacturer's instructions on your chemicals to measure and add them to your water. Yes, skimming is just as important in keeping your water clean. Bugs, flower seeds, dust, and sand can all be blown into the water or drop in on a windy day. Leaves and bird feathers are often too large for some skimmers and pool vacuums. Skim the top of the water whenever you go outside to use the pool or are doing a vacuuming. Skimming before you vacuum helps so you can see the bottom of the pool. 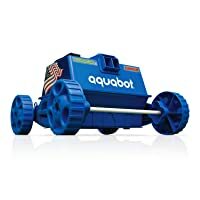 If you tend to get a lot of leaves in your pool, the Aquabot APRVJR Pool Rover Junior Robotic Above-Ground Pool Cleaner has the power to pick them up from the pool bottom. And it doesn't require a hose! Vacuuming your pool is an important part of keeping your water clean. Debris, sand, dirt, and many other pollutants collect on the bottom of your pool. Once everyone is done swimming and a few hours have passed, you'll see all the dirt on the bottom of the pool. This can cause a buildup of germs, bacteria, and algae. The vacuums we reviewed in this article all have powerful suction and have proven to be the best choices. If you have a solar cover for the hot months, the cover itself will prevent a lot of dirt, sand, seeds, bird feathers, leaves, and more from landing in your pool. But don't let the seemingly clean pool bottom fool you, a vacuuming works to grab all the small particles of dirt hidden from sight! Above ground pools are making a comeback and they're being welcomed with elaborately designed swimming areas. Families like the staycation idea and will put time into the landscaping around their above ground pool. From elaborate decks, tropical plants, barbeque areas, water fountains that sit in the pool, colored lights, and other creative décor, the above ground pool is coming out as a simple answer to a vacation in the tropics. To enjoy your backyard pool, be sure to purchase one of these top rated, best vacuums for above ground pools. Then, dive in and enjoy your backyard oasis!